"Diversity is the true thing we all have in common- by Annonymous so why not Celebrate it every day "whoever spoke these words could'nt be truer. We always find Unmatched Beauty in Diversity, greatstrength, and Pride. Diversity is invincible- it has the power to destroy prejudices and intolerance and create a bond like no other.There could he hatred simmering around us, but as long as there is diversity, we can overcome allof it. India is know for its Jaw dropping diversity, "Unity in diversity is India's strength. There is simplicity in every indian. There is unity in every corner of India. This is Our strength".-Narendra Modi. Known for its beautiful people and Traditional attire the state has unmatched thich forest beauty and ample timber wealth - The state has an exotic collection of socio- cultural life that blends many types of cultures and traditions. Shawls, skirts, wraps, lungis, are the fashion favourites here. Arunachal Pradesh is a treat for those intersted in a glimpse of cultural diversity. Gujarat mesemerises with its colourful festivals, sweets and spicy street food and a vibrant Kaledioscope of crafts. With beautiful places like Rann of Kutch and Gir National Prk, Tasty food like Dhokla, Khadi and various Sabzis and beautiful handicrafts like the bhandhinis the state of Gujarat, also known as the Jewel of Western India is sure to leave you Speachless. 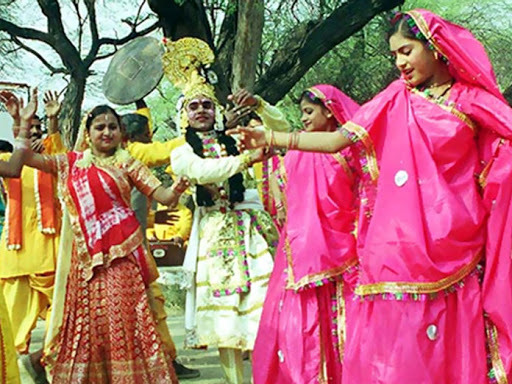 The rich culture of Gujarat also consists of their uniquely designed traditional costumes. The dresses for men include Kediyu or Kurta on the top and Dhoti or Chorno at the bottom Women in Gujarat wear sarees or Chaniya Choli. Recently, they have started wearing salwar kameez as well. Phento is the head gear or a turban wear worn by Gujarati men, especially in rural areas. It consists of a layered cloth wrapped around the head. Young boys do not wear much jewellery. The men of Gujarat may wear a gold ring and a gold chain. The state has a ancient history that embraces its contemperory lifestyle. People are very religious here. The eastern state is popular for not only its archeological wonders, but also vegetable- dyed kotpad handloom. Sambhal puri silk and Kataki saree are famous here. These sarees designs contain a very peculiar design and seem very deginfied. Men are seen in Dhothi and Kurta and gumucha during festivals. Apart from its rich culture literature and culinary history, Tamil Nadu's gorgeous silk Saris, historic temples and intricate gold jewellery make you fall in love with it. The state is known for weaving the Pure silk Kanchipuram saris. Maharasthra is known for Paithani sarees, women adorn wearing a gold puneri nath, ambada in hair, green bangles and a crescent shape bindi. The state is known for its Muga silk mekhela chador with traditional jewellery the dugdugi set, decorated with gemstones and minakari work. The gamkharu bangles are known for the flora and fauna of the state. These two words are suffice to describe the Northern state of India. The sheer beauty. The craftsmen of the state have made five pashmina shawls, walnut wood carvings among other arts, a trademark. 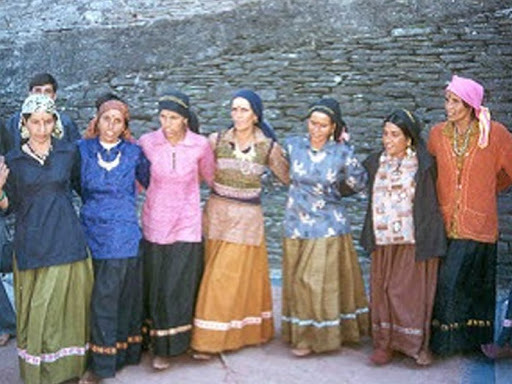 Here, people are seen in a phiran, a loose fit garment to protect from the winter chill in the valley. It is believed to be the birth place of Sita. It is one of the oldest inhabited places in the country Married women wear orange sindoor as they pray for long and happy life of their husband. They are know for Benarasi sarees, keeping the pallu in front, Red glass bangles, red bindi, and red lipstick are a part of suhagan's shringaar( the married woman's makeup). The indomitable women of this effervescent state love colours. The women in this state are seen wearing a Daaman( lehenga) with a shirt that depicts equality. It's paired with chunder dhupatta with mirror work and silver tagdi ( waist belt), borla( maang tikka) maatha patti and necklace. The tribal community, The baku the attire here which is worn by men and women here, a full sleeved blouse (honju) worn by women, and the striped clothing, pangden( worn by married women) , stand out. The vibrant state represents konkani and portugues cultures, they wear a breezy floral shirt and a fedora hat. The beautiful state stands out not only because of its ample resources and industrial might, but also the lush forest cover, and many a tribal communists that call it home. Muslim emperors left an indelible mark on the culture of Andhra pradesh. 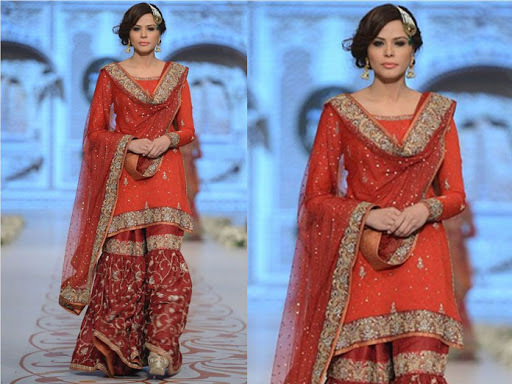 Sharara Traditional garment worn by Muslim brides it is paired with nath and Kundan paasa. Rajasthan is one of the most vibrant and colorful state, it is known for its rich smorgasbord of crafts. The people in state wear Bhandini pagri, angarkha and dhothi that showcases the lively spirit of this state. The state of the Tripura is famous for its intricately handwoven costumes, influenced by various tribes. Tribals make jewellery with bronze and silver using coins. Majestic temples, serene beaches, lush trees full of greenery. Kerala is indeed God's own country. people here wear mundu, a golden border pattu along with a chandan tilak on his forehead. The state enchants you with its scenic beauty, vibrant orchids and a variety of fruits and vegetables. People here wear the silk ka dhara with a coloured pearl necklace- paila. 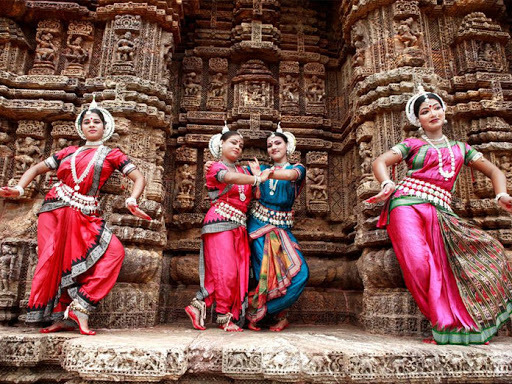 Devbhumi, the land of gods, captivates you with its stunning landscape and culture. people in the state wear bright red tika and traditional topi. An over lapping jacket on the trouser, with sneakers to showcase the cosmopolitian spirit of the Capital city. The composite culture of Delhi is what makes it a fashion Hub. wrap around skirt) with a white blouse and a beaded necklace. For the lion hearts of Punjab, the sun always shines bright. people are seen wearing a Nehru jacket and a Kurta teamed with a smash. The state known for its sculptures of Khajuraho, rich wildlife, and vibrant street food, also produces beautiful silk. women are seen wearing beautiful vibrant maroon kosa silk sari with a net border, paired with glass bangles and silver jhumkies. Know for terracotta temples, beautiful sundarbans, and soul stirring baul music, this state is also the food bowl of India. Knatha work sarees are known here and block prints. The Nivi style drape was popularised by the women of the Tagore family. The state is dotted with breathtaking trekking trails and temples. The chamba valley has inspired many folktales and songs. people here wear a white kurta with yellow nehru jacket with red shawl and the vibrant pahari topi. This is Home to myriad communities, the state with stunning waterfalls and rich forests, is a visual spectale. jharkand people wear a kurta with pyjama and a turban. women wear kodagu style sari with the pleats at the back. It is inspired by the tale of sage Agasthya and his wife cauvery. she broke the pot and transformed into the river, kaveri. The river swept the sari pleats of the women around. The beautiful state is known for plush handlooms such as phanek and inaphi, handwoven by women folk. Steeped in history, the holy banks of varanasi in the glorious state of Uttar Pradesh offer spiritual solace. The weavers have struggled through decades to fight off power lomm with the art of everything hand made. from brocade woven on silks to zari and the fabric of dreams- kinkhaab ( woven with gold, silver threads) beauty is inherent in their craftmanship.